Another week begins and we have a modest batch of games to consider in the European Nintendo Download Update. There are the two versions of the final Mega Man Battle Network title on the Wii U Virtual Console, a neat demo on 3DS, DLC and the option to pre-purchase a major retail release coming later in the month. Throw in some discounts and a 3DS HOME Theme and that's the lot, so let's get to it. Mega Man Battle Network 6: Cybeast Falzar / Gregar (Capcom, €6.99 / £6.29) - Rather like with the 'Classic' originals on NES, Capcom decided that six was the magic number for this particular series on Game Boy Advance. We've rather enjoyed this RPG series, albeit the evolution between each entry has been minimal at times, and both versions of this sixth entry arrive with their minor differences. We'll bring you a review soon. Final Fantasy Explorers (Square Enix, €39.99 / £29.99) - The game itself is released on the eShop on 28th January, though pre-purchase will be available from 14th January. Those that pre-purchase the game before that eShop release date receive a free 3DS HOME Theme - FINAL FANTASY EXPLORERS Legendary Characters. Mega Man Battle Network 6 (both versions) for me! No Pictoparty this week too? Might as well download the demo. Nothing for me, but I might find something similar to @andrea987 @shaneoh avatars. The differences between the Faltzer and Gregar versions weren't that minor actually. You get completely different Cross Navis during the course of the game, and even a different final boss. Many boss battles are not found in the opposite game as a result. Now, we're only missing the GameCube game, Battle Network Transmission. Add that and we'd have the whole Megaman Battle Network series on the eShop! NO MORE MEGA MAN games! I didn't even know there was that many! A lot for me. Yay! Damn. Always disappointing when there isn't anything for you. I am wondering if there will be a Nintendo Direct this week or at least soon, as I would imagine Nintendo would want to promote Mario and Luigi: Paper Jam in America and Hyrule Warriors Legends in Japan as both of them come out between 21-22 January this month. I am not trying to spend a rumor, just using my logic really as I like to wonder and think . Still it is exciting to think about that we might get a Nintendo Direct soon ^^. (Note: Nintendo said themselves that they would change up the Nintendo Direct format a bit in 2016, so we might get more surprises than what we might think). Also might pre-purchase Final Fantasy Explorers. So. Maintenance + nearly no games on eshop = Nintendo Direct? I think we have enough bloody mega Man games on the GBA. Have they just forgotten about Sonic Advance? I'm pre purchasing FFE as soon as they allow it in the US! @SanderEvers I know , but still we don't know much about Pokkén Tournament's release date nor what new things we will get in Twilight Princess HD, so I think we will get a Nintendo Direct before the end of February anyway ^^. I wouldn't get disappointed as the Nintendo Direct "prediction" I made are just based on logic really. Who has the most games overall,Mega Man or Mario? and ANOTHER fantastic week for 3DS gamers, especially if you want nothing to play or discounts on terrible games. Ah finally, the (semi-)next Etrian Odyssey is coming soon. I might do a Classic run of the first Untold game while waiting for it. This demo will also hopefully keep me busy for an hour or two. Looks like Runbow for sure and maybe Cubemen 2 for me - might get Fullblast too. Besides that there's Final Fantasy Explorers and Etrian Odyssey demos. Yes please to more 3D Classics and yes pretty please to Power Drift! Not sure why Final Fantasy Explorers is getting a pre-download. Makes no sense to me. I think I might get it, but I'm going to hold off for awhile before doing so. I rather now predownload it, then find there's a problem that needs to be rectified. My N3DS' connection to the internet is shotty enough as is. @RadioShadow it could be keeping for the anniversary thing, like that week these games on eshop i kinda see that happening tbh. Since I've recently finished getting everything in Etrian Odyssey Untold and I enjoyed it, I shall definitely get the demo for Untold 2. None of the temporary discounts interest me this week, not even Bombing Bastards. This reminds me I still haven't played the first Etrian Odyssey Untold. Woah. Might get Battle Network 6 but seeing how I've already planned on buying the other five games before it and didn't, it probably won't happen this week. @Rhydas Pre-downloads are so that people with bad internet can still play the game on release day. Horrible week once again! What's the deal? Hopefully we get Battle Network 6 over here in NA soon. I still have fond memories of playing both versions. Mega Man games are fantastic, The download week is always considered great for me if Mega Man shows up. 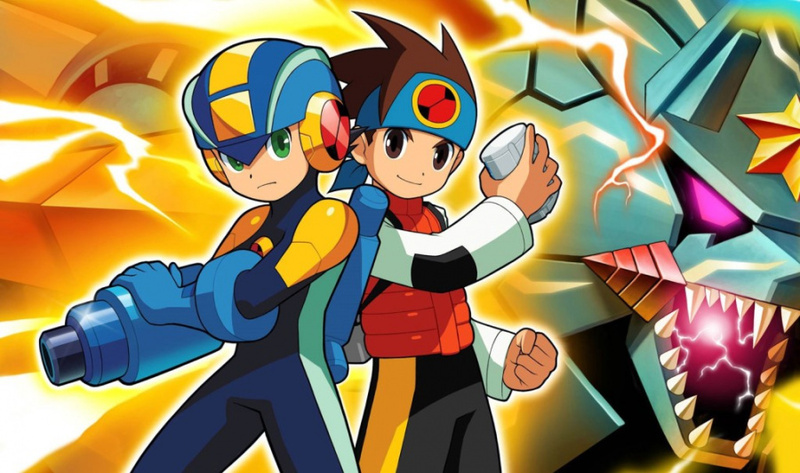 I'm excited to see if the Mega Man Star Force series and the Mega Man ZX games will arrive on the Eshop. Star Force 3 Never got an official Euro release so VC would be a great place for people to experience one of the finest Mega Man games of all time, if they missed out on it initially. Nothing at all! Nothing at all! Nothing at all! Battle Network 6 was one of my all time favorite gba games. I'm probably just gonna pick up FF Explorers though. Whew hew. Free FFE home theme. That's better than that free game Japan got. Its Mega Man's 30th anniversary next year. Yet yes, there are enough Mega Man games across the consoles that there is more than an average of two released per year despite several years of neglect. Because they exist? And now that they've done the GBA games, they can start releasing the five DS games. And hopefully Mega Man 64 too. I'll download 5 and 6 eventually but the games are too similar that I don't need them right now. @TG_Jono more like barely any new eshop games + maintanence = regular NOA. Have they done anything worthwhile on the eshop as of late?